Yesterday, Apple quietly announced that they would cease future distribution of their own custom Java packages, concerning some Java developers. But no need to worry, Steve’s already already explained Apple’s thinking on the matter, and it makes sense to us. First, Apple’s announcement of Java deprecation. 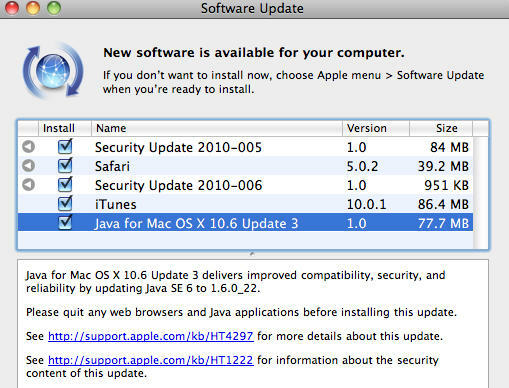 According to the updated developer documentation for the Java updates for OS X released yesterday, Apple will no longer be maintaining their Java runtime at the same level, and it may even be removed from future versions of Mac OS X. So does that mean that Macs will no longer have up-to-date Java? A concerned Java Developer from Portico Systems emailed Steve Jobs, asking that very question. In other words, Apple’s leaving Java to the company that does it best… that is, if Oracle decides to step up and produce their own version of Java for Mac, as they do for every other platform. My guess is they will quickly fill the void and it’ll be a win for everyone: Apple no longer has to spend the money to produce custom-baked, already-obsolete versions of Java, and Mac users will get Java of the same level and quality as it is available on other platforms.